An economical solution for high-capacity dispensing of any brand of C-fold or multifold towel. 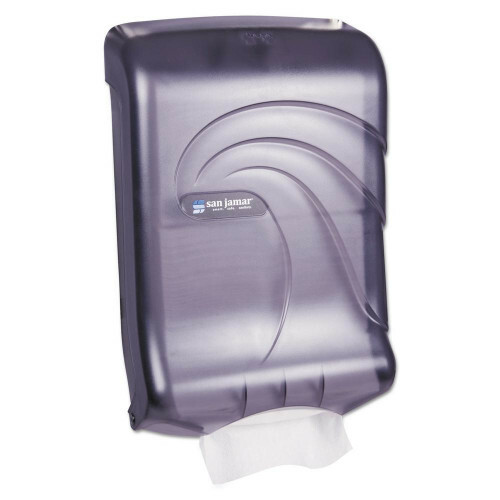 The Ultrafold family of folded towel dispensers offer a clean, low-profile design which make them ideal for tight spaces. The Present System offers a smooth, one–at–a–time towel presentation of C–fold or multifold towels that enhances efficiency and image. Oceans wave design imprinted on cover. Towels Dispensers Type: Folded Towel Dispenser; Material(s): Plastic; Capacity (text): 750 Multifold/450 C-Fold; Color(s): Transparent Black Pearl. I had occassion to order syringes through this site which arrived extremely quickly, intact and as described. I also enquired about some discontinued syringes we have been looking for and staff member Dennis went out of his way to locate some for us ensuring a large supply for the years ahead. I could not be more impressed with the service and the delivery speed of this company. Businesses throughout Canada could learn some things from the people here at mywellcare...... hands down.